In the early 1970s, the British sketch comedy TV series Monty Python’s Flying Circus promised viewers “something completely different” and then, to the delight of its fans, delivered on that promise. When: Wednesday, July 26, 2017 at 8 p.m.
Over the past five years, doing “something completely different” — performing and recording a cappella country music — has been the key to success for Home Free, the Minnesota-born quintet which will return to Del Crary Park’s Fred Anderson Stage on Wednesday, July 26th as the free Peterborough Musicfest concert season continues. Founded in 2000 by Chris Rupp, Home Free initially performed music covering a wide variety of genres, country being just one among them. With a series of independent album releases to its credit, Rupp et al auditioned three times for NBC TV’s The Sing-Off and three times came up short. Enter lead tenor Austin Brown and bass singer Tim Foust and yet another shot at The Sing-Off. Performing country music exclusively, Home Free was accepted and won the show’s fourth season, earning $100,000 and a recording contract with Sony. “When Tim and I joined, the group moved in the country direction and found that audiences responded well to it,” says Brown in a November 2016 interview with Kevin Wierzbicki of www.axs.com. The evidence points to the enduring wisdom of that decision. The group’s 2014 album Crazy Life — the first featuring Brown and Rupp — peaked at number eight on the Billboard country chart. Full Of Cheer, released the same year, attained the number 12 spot before 2015’s Country Evolution lifted Home Free to lofty number four status. The group returns to Peterborough — having performed at Peterborough Musicfest in August 2015 — basking in the success of late 2016 release Full Of (Even More) Cheer, which climbed to number two. Having undergone a number of personnel changes since the group began as basically a hobby, Home Free is now enjoying stability with Brown and Foust joined by Rob Lundquist (tenor harmony), Adam Chance (baritone harmony) and founder Chris Rupp’s brother Adam, a beat boxer who provides percussion sounds with just his mouth and vocal chords. Chris departed Home Free last year in pursuit of a solo career, opening a spot for Chance. With their voices their only instrument, great care is taken to keep them in optimum condition. Home Free is nearing 100 million views on YouTube, has guested on Kenny Rogers’ latest Christmas album, and has attained the ultimate dream of any bonafide country music act: performing on Nashville’s Grand Ole Opry stage. Ahead for Home Free is a new studio album, scheduled for release late this year, and a hectic performance schedule that includes a major U.S. tour in the fall. 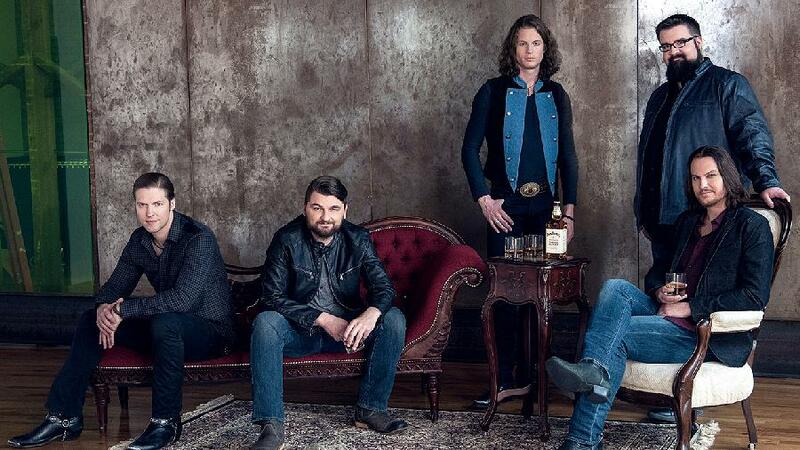 For its Musicfest appearance, sponsored by Ashburnham Realty, Home Free will serve up equal helpings of original songs and covers of popular songs.